Printed c.1837 by George Baxter using his patented Baxter Process. This is an illustration in Baxter’s book "The Pictorial Album or Cabinet of Paintings." The book contained 11 prints together with descriptions and poetry. It was published shortly after Baxter patented his process and was an advert for this new process and George Baxter's work as well as a desirable book for the drawing room. 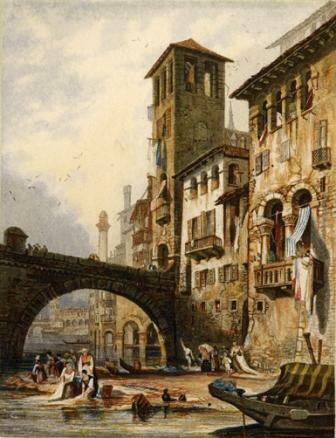 The print is after a painting by S Prout and George Baxter produced a second version of this view in 1850. Print size 13.5 x 10 cm. Printed on tinted paper.